Nylon – is the most popular carpet fiber and is preferred because of its strength. It has exceptional resilience and retains its texture well. Nylon carpet fiber is soft yet strong, shows color brilliantly, and cleans well. Advanced generation nylons offer the latest in fiber technology and a built-in ability to conceal and resist soil and stains. Polyester – is naturally stain and fade resistant. It has excellent color clarity, color retention, strength, and abrasion resistance. Carpets made from polyester are easily cleaned and resist water soluble stains. Polypropylene (Olefin) – the use of polypropylene in carpet has grown over the last ten years due to the popularity of Berber style loop carpets. Polypropylene is extremely resistant to stains, fading and moisture. Polypropylene is also notably colorfast because it is solution dyed, meaning the color is added during the fiber production and not dyed later. Because it’s so resistant to moisture and mildew, it’s generally a good choice for both outdoor and indoor areas including playrooms, kitchens and dens. Wool – was the original fiber for carpets. Wool is a tough fiber that can take a beating without losing its strength. Dust, dirt and oil-based stains come out easily because wool naturally releases the soil rather than absorb it. Because it is the most expensive carpet fiber, wool is generally used only in luxury carpets and area rugs. Engineered Hardwood is also 100% wood. Its cross-ply construction allows installation below or above grade even over concrete. It resists expansion and contraction caused by temperature and humidity changes. Engineered flooring is typically glued-down, stapled-down or floated over an existing floor. It is manufactured by permanently bonding together multiple layers of solid wood in a cross-ply construction. Engineered hardwood is usually the only type of hardwood that is recommended for use below grade. Hardwood Screening - Sometimes a full hardwood refinish is not always necessary, particularly if a color change is not in the plans. Hardwood screening involves performing a light buff to remove the existing top coat and then applying a fresh coat of polyurethane. This process removes fine surface scratches and scuffs, bringing your hardwoods back to life. It is a much less invasive process, only taking one day to complete, and is a fraction of the cost of performing a full refinish. Hardwood screening is ideal for wood floors that have been well maintained; floors that have more significant wear or deeper scratches may not always benefit from a screening. If you have new floors or have just completed a refinish, consider implementing a maintenance program of screening every five to seven years. Proper care is crucial to extending the lifetime of your floors! Wear Layer – easy to clean surface contains aluminum oxide that protects the floor from stains, fading and wear. Image Design Layer – a photographic image of wood, stone, brick or virtually anything you can imagine. Inner Core Layer – provides the floor’s structural strength and stability. It is made from high-density fiberboard. Backing Layer – is made with resin saturated paper. It creates a moisture barrier that protects the floor from warping. Laminate flooring can be used in virtually any room in your home but it does have some sensitivity to excessive moisture so it would not be appropriate in a bathroom or outdoor use. Resilient is the name given to products like linoleum, vinyl, rubber and similar products because of the flooring’s solid nature and its ability to flex or “give” a little when walked on. 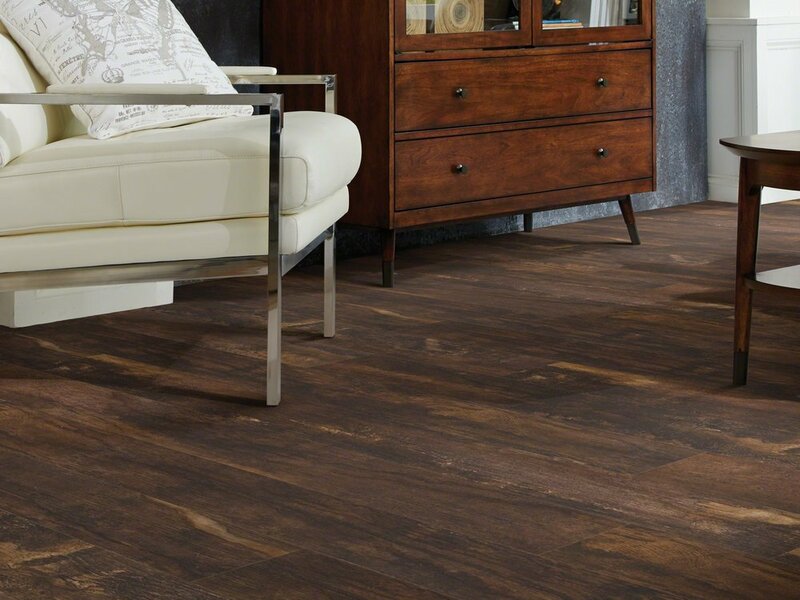 Luxury Vinyl Tile (LVT) and Luxury Vinyl Plank (LVP) are at the high end of resilient flooring. They have high performance and high fashion. New designs include contemporary colors, vivid brights, exotic and distressed woods, colored concretes and fossilized stone. LVT and LVP perform better than wood and stone. They never need refinishing, will not warp due to excessive water, resist scratches, remain quieter to walk on and warm to the touch.